Textiles Festival held last month, apart from getting inspired by her drive to restore and revive the heritage handloom of Odisha, I recognised a childlike exuberance in her. The child who is acting on impulse and is adamant about something dear to her heart. Luckily in Gunjan’s case, that childlike impulse is channelised to take the old dying weaves of Odisha to greater glory. Even as she took a bow at the fashion show in the same festival, I saw that her design aesthetics has taken these old heritage textiles to a modern platform. The aesthetics are classical but the execution is contemporary. My interest was piqued and I knew I had to learn more about Vriksh and its founder, Gunjan Jain. 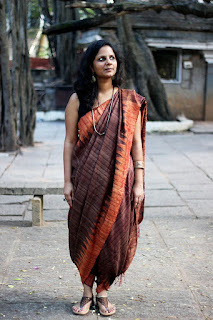 Vriksh is an alternate design studio in Odisha founded and headed by this talented girl and it works solely with handloom weavers and natural materials exploring the rich textile tradition of Odisha. Vriksh offers the finest tussar silks, experimental silk ikats and natural dyed weaves, to rare revivals like Bomkai and Dhalapathar saris. Following the mantra of ‘Creativity through Conservation’, the weavers’ experiences, knowledge and wisdom on the beautiful tradition of weaving have been the underlying strength of Vriksh. Her clothes are almost synonymous with her. Easy and effortless, Gunjan’s creations might look too simplistic but when inspected in detail, they bear the stamp of her painstaking efforts to revive the dying ikat weaves of Odisha. Witnessing her interact with that award-winning master weaver from Neopatna in Odisha is another testimony that she understands the passion and efforts that these unsung heroes infuse their craft with. But she wants the luxury textiles to be embraced for not just their beauty but their versatility as well. So, her brainwaves ensure she cuts smart sharp modish silhouettes that move fast in fashion circles. soon disillusioned with the industrial process of making clothes and their resultant commoditisation, she she packed her bags and moved to Odisha, where she set up her design studio Vriksh in Bhubaneshwar in 2008. 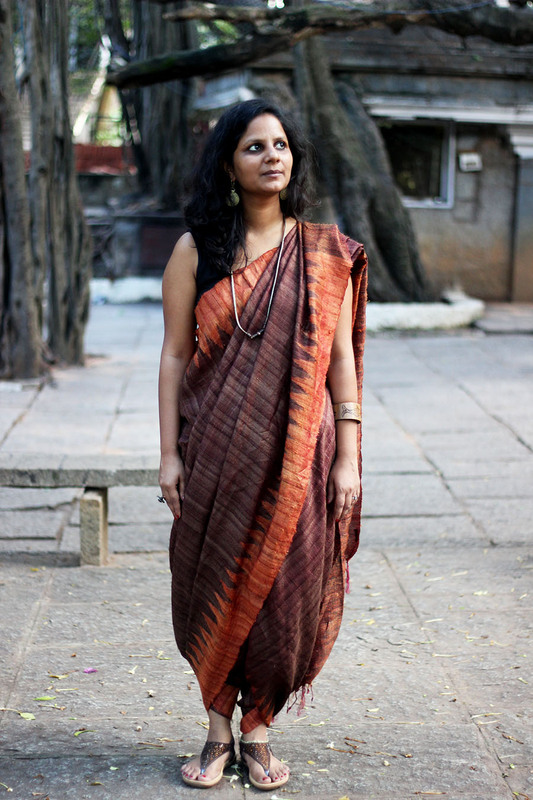 “Those early years in Odisha with one of the world’s oldest and greatest traditions of ikat weaving changed my life. I picked up the language because I wanted to closely work with the traditional weavers and interact with them. I ensured that a bond was created. If they did not learn to trust me and my design aesthetics, Vriksh would never succeed,” she recalls.